The Grand Moravia Jazz Trio. 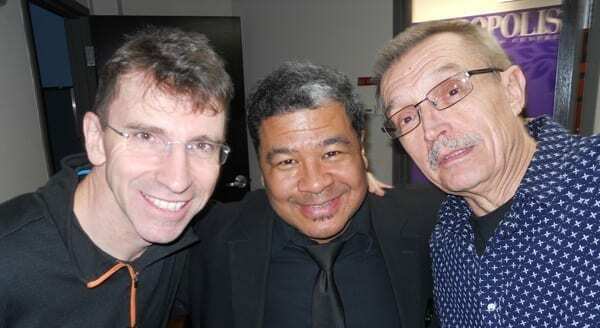 Left to right: Petr Dvorsky (bass), Ernie Adams (drums) and Emil Viklický (piano). CEDAR RAPIDS, Iowa – Czech master jazz pianist Emil Viklický will bring his Grand Moravia Trio to Cedar Rapids to perform a concert Wednesday, May 30, at the National Czech & Slovak Museum & Library (NCSML). Joining Viklický for the 7:00 p.m. concert will be bassist Petr Dvorsky from the Czech Republic, and for the first time in Cedar Rapids, drummer Ernie Adams from Chicago. Tickets are $25 for VIP front-row seats; $18 for general admission; $10 for student admission. Viklický often performs in international ensembles alongside musicians from the U.S. and other European countries. He has become noted for his unique synthesis of the melodicism and tonalities of Moravian folk song with modern jazz. As English critic Euan Dixon wrote, “Emil Viklický is one of those European jazz pianists who successfully incorporated elements of his indigenous folk culture into jazz”. He recently composed and arranged a big-band setting of Antonín Dvořák’s “Humoresque” for performance by Wynton Marsalis and the Jazz at Lincoln Center Orchestra. This concert is sponsored by CRST International; Tom and Le Ann Kadlec in honor of Bev and Gene Kadlec, and Duane & Kay Nesetril; and by George and Beth Drost.